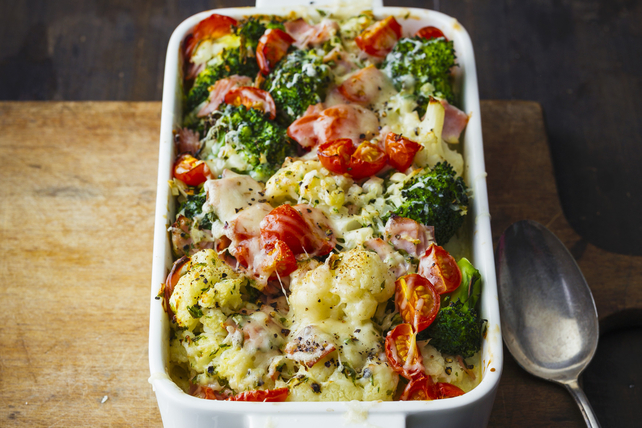 Our delicious Cheesy Cauliflower, Broccoli and Ham Bake is a wonderfully comforting casserole. And as a bonus, it's a great way to use leftover cooked ham. Cook broccoli and cauliflower in boiling water 4 min. or until crisp-tender; drain. Place in 13x9-inch baking dish sprayed with cooking spray. Add ham and tomatoes; mix well. Cover with pasta sauce. Bake 20 min. or until heated through. Top with cheese; bake 10 min. or until melted. Prepare using Cracker Barrel Shredded Mozza-Cheddar Cheese. Combine cooked vegetables, ham and tomatoes in prepared baking dish. Refrigerate up to 12 hours. When ready to serve, top with pasta sauce and bake in 400ºF oven 25 min. or until heated through. Top with cheese; bake 10 min. or until melted.